Thanks HM, I had a look at millipede tracks and they all seem to have 2 parallel tracks. The pic below is the nearest one I can get to the surface that you posted. When you said invertebrate, I wondered if it might be something pushing a dung ball, but looking at images, the tracks are wobbly and mainly from the feet of the beetle. I have another theory, your workmates know you are into tracking, they know your route to work and they decided to mess with your head. The Qld version of crop circles. Yeah, might have to go there at night. A hoop snake on its way home from the pub. Bloffy dragging a stick to explain how long a kangaroos tail can get. Easy one for the newbies, what made the marks on the logs. Something sharpening its claws? As they are quite deep & at ground level, maybe a wombat? Not anything natural, it’s in Western Australia so no wombats. Its a log right, its not a downed fence post? OK last guess it was your knife or your hatchet, you were chopping kindling or something? Maybe it was only easy because I knew what it was. Some more hints in order then, it’s a downed tree in the middle of a walking track the marks are made by something metal. Frequented by the MTB fraternity? Front cogs scraping over? Yes front chain rings from feral mountain bikers. I never would have guessed it. Where I live it is so remote, I don't think I have ever seen a MTB rider out here! What is the name of the spider? 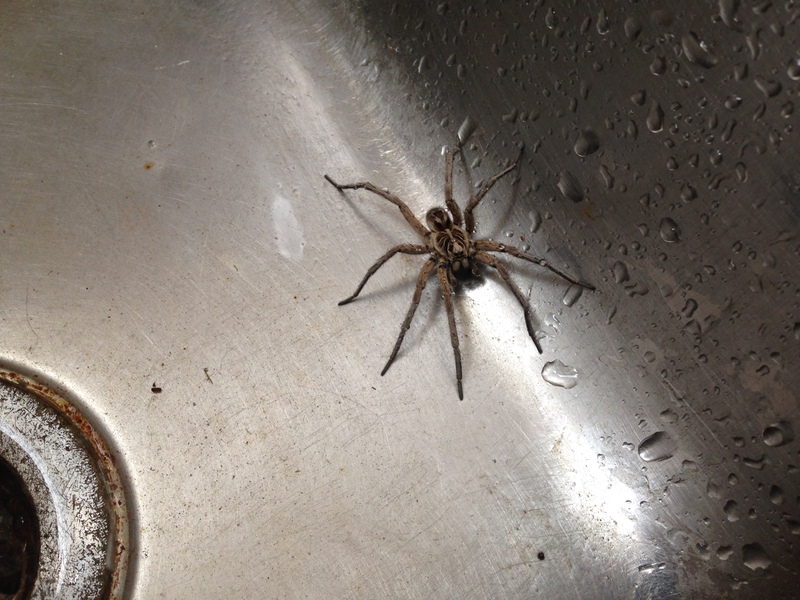 Looks like a wolf spider to me. it was displaying to another goanna or injured or carrying something? I thought about your last question hairyman. It's funny, I often try to interpret tracks, but find photos frustrating It's also something I haven't had much opportunity to do here in Tassie; not many places where you can see tracks so easily. Again, looking at your photo, on the edge of the road the gravel has been washing off in the rain around the tufts of grass. This suggests the road is fairly rounded to maintain water run off. The goanna is running along a slight slope near the edge of the road. For him to do this, he has to compensate some how, hence the tail on the left side. If we could see his feet marks clearly, I'm also guessing the inside (left) strides would be closer together than the outside (right) strides. And both goannas are traveling in the direction that this photo was taken ie away from the camera (I can explain that if you like). If he was running on the other side of the road his tail would still go to the inside of the road too. Also, because the inside of the road is slightly higher (because it is rounded); this would exaggerate the impact of the tail to the left. So, the goanna was holding it's tail to the left; when his left rear foot dropped forward, his tail hit the ground. When his right rear foot moved forward, his tail was still in an arc to the left but above the ground. It looks like the smaller goanna goes from nearly flat ground to sloping ground (symmetrical tail movement for a bit, then to left side only) and this continues intermittently but never right side only. He is further out on the edge where the slope is starting to be leveled out by the gravel washing off the rounded area of the road, but of course, this isn't a uniform process, hence some flat (or nearly flat) and some slope. I doubt that the goannas were there at the same time; somewhere between 5min and an hour apart of each other? Or possibly within sight of each other, but not by choice. I found this picture on the net. In this shot the goanna is running toward the bottom left hand corner. The slope is running down from top left to bottom right more or less. For most of the picture the tail is held to the up hill side. At the top of the picture, you can see that he is finishing making a turn from somewhere to the left (tail track and downhill side - the right - foot track meet). Then from about one third of the way down the picture, he moves across the slope.